It allows moisture in shortly after application and nutrient out once soil temperature rises above 6°C in line with the requirements of the grass plant. The thickness of the coating determines the longevity of the application, with products designed for 5-6 month and 6-7 month release. These products are available as a Spring/ Summer range and as a Winter/Autumn Range. After application, the granule takes up moisture over a peroid of 7 – 10 days. A small portion of the nitrogen is uncoated for initial release. Release carries on through the growing season according to the Soil temperature, If it drops so does the release rate. After a minimum of 5 – 7 months , the nutrients are totally released and the granule degrades. A Polymer-resin coated controlled release fertiliser that releases its nutrients according to soil temperature only over a 5 – 7 month period from a single application. Nutrient release controlled by temperature only. Resin coating prevents nutrient leaching. Controlled release potassium in some formulations. 25Kg Bag. Regular granule for golf tees, approaches, fairways, sports pitches, racecourses and general amenity turf. Cutting heights at or greater than 10mm. Fine granule for close-mown golf tees, approaches, fairways, sports pitches, racecourses and general amenity turf. Cutting heights greater than 6mm. Fine granule for fine turf including golf and bowling greens. 5 – 6 months controlled release potassium nitrate based, sulphur free fertiliser. Regular granule for golf tees, approaches, fairways, sports pitches, racecourses and general amenity turf. Cutting heights at or greater than 10mm. Cool temperature “fast start” portion for quick response at low temperatures. 5 – 6 months controlled release nitrogen fertilizer, containing sulphur. Regular granule for golf tees, approaches, fairways, sports pitches, racecourses and general amenity turf. Cutting heights at or greater than 10mm. Available as slow release granule, as a freely dissolving soluble, or as a liquid. Regular granule for coarse mown tees, fairways, pitches etc. >10mm cutting height. App rate: 20-30g/sq.m. 25Kg Bag. App rate: 10-20g/sq.m. 20Kg Bag. Highly soluble, slow release, microprilled urea. App rate: 1-3 bags / ha. 20Kg Bag. Convenient liquid spray, stabilised nitrogen efficiency. 5 – 6 months controlled release potassium nitrate based sulphur free fertiliser. Regular granule for golf tees, approaches, fairways, sports pitches, racecourses and general amenity turf. Cutting heights at or greater than 10mm. Regular granule for pitches etc, up to 3 months release. App rate 20-35g/sq.m. 25Kg bag. This term refers to the more traditional chemical fertilisers which release nutrient fairly quickly, though there would be variations depending on soil temperature with nitrate and ammoniacal forms of nitrogen giving better response at lower soil temperatures than urea. They are available as blends (where straight forms of various nutrients are mixed in a bag) or as homogenous granules (all the nutrients are contained in each and every granule) which provides a more even and consistent turf. Granule size and ease of breakdown are important considerations as well as risk of scorch when choosing a conventional fertiliser. A range of homogenous fine granulated fertilisers suitable for greens and other low cut areas. Combinations of up to 4 different nitrogen sources are used. This means greentec responds well over a wide range of conditions, even during periods of low soil temperature. Rapid granule breakdown minimises pick up. Traditional spring /summer fertiliser featuring a high % of annonium sulphate, combined with 2 further nitrogen sources to give good low temperature response. Contains phosphate and potash to maintain soil levels where needed. Magnesium and iron for enhanced turf colour. Mini-prilled potassium nitrate. It consists of an immediately available form of nitrogen, chemically combined with potassium for rapid uptake into the plant. It is suited for use at any time of the year, providing readily available nitrogen for a quick response (even at low soil temperatures) and high potassium for wear and disease resistance. A range of homogenous fine granulated fertilisers. Combinations of up to 4 different nitrogen sources are used. This means greentec responds well over a wide range of conditions, even during periods of low soil temperature. Rapid granule breakdown minimises pick-up. High potassium fertiliser suitable for autumn/winter or early season use. Contains nitrogen from 3 sources to ensure cool temperature green-up, but with high potash to harden and protect grasses. Contains iron and magnesium to enhance strength and colour response. High nutrient analysis combined with a midi sized, homogenous granule, allows low application rates to be utilised. Nitrogen split between nitrate and ammonium forms for rapid response. Low salt index for turf safety. Cool temperature spring starter. High nitrogen analysis, homogenous granule, for cost effective application. Nitrogen split between nitrate and ammonium forms for rapid response. Low salt index for turf safety. Cutting height greater than 10mm. Organic Fertilisers contain natural slow release nutrients whereby organic matter and protein contained therein provide a food source for soil microbes to utilise and breakdown, gradually releasing nutrient to the grass to provide sustained growth. They are most effective when soil temperatures are 10°C and above as soil microbes are more active. Homogenous granule, even application of nutrients for uniform response. Contains both nitrate and ammoniacal nitrogen for excellent availability at cool temperatures, and urea and organic nitrogen for extended gentle release. 100% Potassium in organic slow release form. Contains both nitrate and ammoniacal nitrogen for excellent availability at cool temperatures, and urea and organic nitrogen for extended gentle release. 50% Potassium in organic slow release form. Complete preseeder, combining all primary, secondary and micronutrients in one granule, along with humic acid and a high carbon content which provides food for soil microbes. Contains ammoniacal nitrogen for fast turf response. 100% Potassium in organic slow release form. A balanced NPK feed where the nitrogen is in ammoniacal form, providing good response even under cooler conditions. Ideal as an organic soil amendment to incorporate into rootzone at hollow tining. Enhanced humic acid content helps stimulate new root development. A fairway grade soil improver containing composted cow manure and humic acid in a granular formulation. It is designed to enrich soil micro flora and encourage root development. With 32.5% organic matter and 18.1% humic acid content, it is ideal for use on impoverished sandy soils with inherently low organic matter content. Headland Soluble Iron is a highly soluble iron sulphate powder, with improved solubility compared to competitor iron products. There are many grades of soluble iron on the market, but this product demonstrates superior solubility in water volumes as low as 300 litres per hectare. Economical dual purpose fertiliser that weeds and feeds. Triple action. Feeds Grass, Kills weeds and Clears Moss. Can be used on all sports turf except Golf Greens. Slow release fertilizer containing recovered phosphorus, nitrogen and magnesim. 8-9 months longevity. High phosphorus starter fertiliser with slow release nitrogen. These are water soluble powders which are dissolved and sprayed onto turf. Trace elements are usually available in this form. Headland’s water-soluble fertiliser range are high grade readily soluble and suitable for application through all types of modern spray systems. Choice of formulations for optimum flexibility. Readily soluble for easy preparation. Incorporate chelated micronutrients for greater activity. Tank mixable with other Headland products. A slow release micro-prilled urea which ensures optimum turf safety and rapid solubility even in cold water. A sulphur-free, high potassium analysis, water soluble fertiliser utilising a fine-milled raw material in combination with a buffering agent to increase the speed of solubility. The 100% nitrate nitrogen formulation is particularly well suited for use when soil temperatures are low and the grass plant requires a small, but rapidly-available nitrogen input. It also provides chemical oxygen which has been shown to combat anaerobic conditions in the soil, commonly referred to as black layer. 1:3:1 high phosphate formulation for use especially when overseeding/aerating, to stimulate new root development. Ideally suited to correct phosphate deficiencies caused by high/low soil PH. A high nitrogen analysis, water soluble fertiliser formulated with a high urea component for maximum turf safety and a quick response during the warmer months of the season. Combination of technical grade sulphate of ammonia combined with potassium nitrate and magnesuim. Highly soluble iron sulphate powder, economical to use. A soluble chelated trace element package containing Harpin, suited for use where a trace element deficiency and/or high soil pH levels have been found.Harpin is a Plant Elicitor, which stimulates the plant to grow better whilst under the effects of stress, disease or nematode damage. App rate: 6-12kg/ha in 300-400L of water. 20Kg Box. 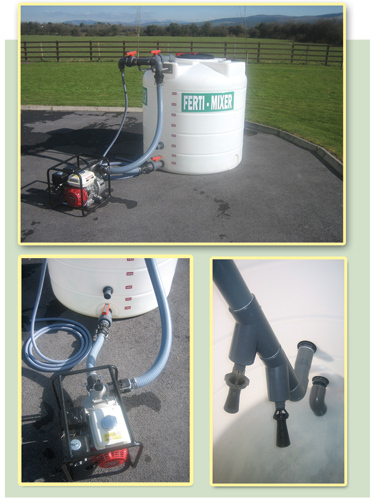 Petrol driven mixer for mixing and storing soluble fertilisers. • Mix rate of 600lt/min. • Will mix large quantity of soluble fertiliser at one time. • Can be used as a store for mixes rather than leaving in sprayer overnight. • Pump can also be used to pump out any flooded areas on golf course. • All connections on quick release cam lock system. • Can be stationary or mobile on a trailer. • Health and safety compliant. • Developed because of demand from greenkeepers to find an easier solution to mix solubles. • Huge time and labour saving which is all important when there are weather or traffic time constraints. • Will allow more specific fertiliser mixes. • Will save money versus buying low concentrate liquid fertilisers. • Will save on transport and packaging. Click to view the Fertimixer PDF. Immediately available forms, are used in the spring more often and are useful for applying small quantities of nutrients in an even manner without the speckling which could be a problem with granular fertilisers at low rates. In calculating nutrient input from liquid fertilisers it is important to know the specific gravity of the product in question……..All liquids are not the same, don’t just go by the analysis on the drum! A concentrated, liquid seaweed extract containing chelated iron. It gives a rapid and long lasting greenup as well as supplying essential nutrients and growth stimulants. Ideal pre tournament treatment. Tankmixed with Liquid Turf Hardener & Turfite, it provides an ideal winter tonic. applies just over 1.5kg N/hectare. High potash and sulphur fertiliser. Ideal for sand based greens where potash deficiencies are common. Improves winter hardiness and discourages disease. PROTEC NK 10+0+10 plus Mg, Mn. PROTEC Hi-K 6+0+12 plus Mg, Mn. 50% of the nitrogen in Protec Hi-K is derived from ammonium and nitrate nitrogen for efficient winter response. The sulphur-free formulation is ideal where existing soil levels are high. HEADLAND’S range of slow release fertilisers contain the unique slow release nitrogen source -TRIAZONE – with a chemical ring structure which binds to soil particles and organic matter, slowly breaking down and releasing nitrogen over a 6-8 week period, depending on the properties of the rootzone and rate applied. Some immediate release nitrogen is added to the formulations to give rapid colour response. Lowest scorch risk of any liquid fertiliser on the market. Does not require watering in after application. Low water volumes required for application. Produces less grass clippings than standard liquid fertilisers. A high performance nitrogen fertiliser with 72% Triazone slow release nitrogen to give sustained feeding over a 6-8 week period and 28% urea to give an immediate colour response, without excessive flushes of growth. Can be tankmixed with a wide range of other products. Contains 60% Triazone slow release nitrogen to give sustained feeding over a 6-8 week period and 40% urea to give an immediate colour response. Can be tankmixed with a wide range of other products.